Easy run with Ted at our standard 4:45 AM time. The pace was not fast enough for long enough to test the form/spine spring. However, I did hit a quarter in 1:38 at the end that felt easy. Ran with the kids in the afternoon. Warmer weather and less inversion. Benjamin and Jenny ran faster. Benjamin ran the last 0.5 in 3:45 rather comfortably. I think he is ready for another sub-7:00 mile attempt. We will probably try on Thursday if the weather is good. The Fast Running Blog is overdue for a number of improvements. We have added a few more runners to the point where even I find the current blog navigational system inadequate, and that is bad - I can use a very rudimentary user interface and be happy. I have had plans to do a predictor with GPX course uploads, or even better - a plotter like gmaps-pedometer.com. Also, need to find a way to place the Google ads better - in a way that is not annoying, but effective for generating click-throughs. The click through rate on the Fast Running Blog pages has not been very good - I hope mostly because the pages have been too interesting to read to leave them. Just need to find the time to code it all up. Early morning tempo with Ted. Standard 4:45 AM. Short warm-up, then 2.5 in 14:11. Ted and I started at a good pace. I had to do a bio-break at around 0.75. After that kicked into gear to try to catch Ted. Hit the mile in 5:47. Caught up sooner than I expected - Ted had to take a bio-break at 1.5, I think I am infecting him with the decease. Went passed him, did not wait. Stayed in gear except for getting out of rhythm on short snow patches. The trail was in good condition except for the first 0.5 miles. Ted finished in 14:13. I think were it not for the bio breaks we probably would have pushed each other into the sub-14:00 range. Not bad for the cold, early, and lots of clothes. On the way back tried to trick Ted into running another 2.5. He went about a quarter, then did not feel good. I coasted putting in a marathon pace effort. Total time was 14:44, but the last 0.5 was 3:02, and I was slipping a lot more than in the first repetition. The stride was far perfect, but better. I felt like I was using the full length of my legs, that is the best way I can describe it. What would be nice is to come up with some measurement devices/techniques and record the measurements along with the feelings. Then after some calibration I'd be able to tell what is going on, just like I can tell the pace and the heart rate correctly by feel right now. Did back exercises on Curt's contraption. Ran with the kids in the afternoon. Easy run with Ted at 4:45 AM. It was snowing. The roads were quite slippery. Both of us almost fell a couple of times. Ran with the kids in the afternoon. It warmed up, and it looked like the inversion had cleared a bit. Benjamin wanted to do a mile time trial. So all of us went to the Orem High track. However, the cold wind was too much for the kids. All Benjamin could do was 7:37. Jenny was supposed to race the Fast Running Mommy, but being still little she had some breathing problems and did some sort of a stop and go. She did run about 8:00 pace during the go. Not having Daddy around did not help either (I was pacing Benjamin). The Fast Running Mommy set a post-Jacob record for the mile in 8:19. Afterwards, Julia wanted to run a special lap with Daddy. Jenny joined us and surged ahead. Half way through Julia changed her mind. That was OK, since she had already run her daily quarter. By that time Jenny had gotten quite far ahead. I wanted to be there at the finish to time her, so I sped up. With 100 meters to go, I realized I really needed to speed up. Ran 15 seconds for the last 100, which I was pleased with. I was in street clothes, it was cold, I had not done any speed work recently, and it did not feel like an all out sprint. My best 100 m ever is 13.9. Worked out on on Curt's contraption. It is basically a bucket with weights attached to a rope on one end, the rope goes over a suspended pulley, and comes out attached to a handle on the other end. So you pull holding the handle, and the bucket comes up. Then you can hold on to it at any angle or height you want, and it can stretch the spine or the muscle group of interest as the weight of the bucket pulls on the rope. Simple, clumsy looking, but very effective. I feel like I am getting a quality workout on it. Added a long-overdue fix to the race entries - now they show not only on the race entries page, but also during the regular blog viewing. Sleep-in day. Ran at 5:30 AM. Tempo run with Ted. Took care of the potential bio-break problems in advance. The road conditions were better than on Tuesday - enough dry spots on the first mile to make much faster than normal. After that, only occasional snow patches. However, you did have to swerve around quite a bit to hit the dry spots on the first mile. Splits by 0.5 - 2:53, 2:56 (5:49), 2:50 (8:38), next quarter in 1:26. After that, I saw we were behind the 5:40 guy by 9 seconds and went after him. Next quarter in 1:20 (2:46, 5:36, 11:24), then 1:22, 1:22, last 0.5 in 2:44, last mile in 5:30, total time 14:08, new inversion/cold/clothes/early morning season record. Ted finished at a steady 5:44 pace in 14:22. The pace felt relaxed for the first 1.75, after that it felt like a slow 10 K/fast half-marathon, which I am happy about. On the way back I knew better than try to persuade Ted to run another tempo with me. Inversion has been hitting him harder than me, and he has developed a cough. So I ran it solo. Decided to cruise at a marathon pace. Ran 5:50 pace for the first 1.5 fairly relaxed, then picked up a bit to compensate for the uphill and the upcoming snow. Overcompensated a bit and ran the last mile in 5:44. Total time 14:29. First 1.5 felt like a true marathon pace just hanging out with the guys getting to know them. 5:44 on the last mile felt like a move try to break somebody. This is good news - this is how those speeds felt in shorts, 50 degree weather, and no inversion leading up to Ogden last year. I felt some bounce in my legs, more efficient stride. I hope it is the Curt's contraption exercises kicking in, not just a fluke. We'll have to wait and see where that goes. Ran with the kids in the afternoon. Lots of inversion. Did some more exercises on Curt's contraption, and then tug-of-war with the kids. Easy run with Ted at our standard time - 4:45 AM. Met him on his way from BYU. A few miles into the run we saw a couple of dogs. Ted told me about being chased by an angry pit bull in Australia at around mile 15 of a long run. Ran with the kids in the afternoon. Worked out on Curt's contraption. Woke up from a dream. 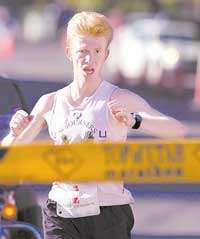 I was running in the Top of Utah Marathon. We had a good pack. Suddenly around mile 9 everybody took too long to consume their drinks. I gulped down two Powerades in an instance and broke away. My form felt terrible, but I was in the lead. I went through my competition one by one trying to estimate how many of them would be able to cover the move and not pay for it by 23. It was too many, but I figured I still had a fighting chance for top 3. Suddenly around mile 10 my cell phone alarm woke me up to reality. To make the dream come true you need to train! Standard Saturday 10 mile tempo run. The trail was clear except for the first mile. It was manageable at the start, but subsequently became worse. 5F temperature, standard 2.5 layers of clothes. Ted helped me on the first 2.5, hit the split in 14:37. After that, he needed to back off to an easy pace to avoid overtraining. 14:56 on the way back, the snow mile did not help (5:59), 29:33 at 5 miles. Coming back the snow mile was 6:04, with the first 0.5 in 3:06. This is as bad as it gets on this run - 180 turn knocks you out of rhythm, and then you have some wet snow to battle. Finally recovered, 14:55 for the next 2.5. Now getting the 59:00 guy becomes a possibility - I need to run only 14:32. 14:32 in shorts, 50-60 degrees, no inversion, and completely dry ground is a nice and relaxed rhythmic marathon pace. Under the conditions of today, 14:32 would require some serious effort. I decided to put in good effort, but not try to run at 10 K pace to get it. If it happens, it happens, otherwise, I'll take what my body and the road will give me. With a mile to go I needed to run 5:42 to catch the invisible runner. If the road had been in its Thursday's condition, this would have been doable. But it was way too slippery. I ended up running it in 6:04 with the last 0.5 in 3:04. 14:54 for the last 2.5, 59:22 for the whole run, course record for the 2.5 clothes layers/inversion/below 20F conditions. Got home, put on ankle weights, ran another 1.7 to make the total of 15 for the run. Benjamin got sick with a fever. Not too bad, but not good to run with. Just ran with Jenny, and then Julia. Got my Nada Chair in the mail to help me maintain proper posture while I sit. Unfortunately I do have to sit to make a living. We'll see if it makes any difference in running. I like it so far.